Majlis Speaker Ali Larijani has strongly condemned the alternate slogans chanted by protesters at official events organized by the regime in support of Palestinians three weeks ago. Speaking at the dedication ceremony of Martyr Motahari's Scientific and Cultural Foundation in the holy city of Ghom yesterday, Larijani took the green opposition to task for deviating from the regime's official slogans on Ghods Day. Ghods Day or Jerusalem Day is an annual event organized by the regime to support Palestinians and to denounce Israeli policies. 'Do slogans and topics like an "Iranian Republic" bring honor to Iran?' Larijani asked rhetorically. On Ghods Day and in previous demonstrations, protesters have chanted 'Neither western, nor eastern, an Iranian Republic' in stark contrast to a similar phrase which ended in 'Islamic Republic' in the heyday of the revolution 30 years ago. This year Ghods Day fell on Friday, September 18, and became a focal point for opposition to the regime as the green movement exploited the official marching routes for its own demonstrations. Despite warnings from then-Basij commander Hossein Taeb and Revolutionary Guards chief Aziz Jafari, protesters turned up in huge numbers in Tehran, Shiraz, Isfahan, Tabriz and other cities. Estimates for Tehran run between 1.5 to two million people. (For a live blog of Ghods Day, go here). The greens refused to utter slogans such as 'Death to Israel' and 'Death to America' which have become mainstays of the Islamic regime. Instead, exhibiting billboards marked 'Palestine is here' or holding up photos of dead protesters, they took possession of some official routes by marching to shouts of 'Death to Russia' and, most notably, 'Neither Gaza, nor Lebanon, I give my life only for Iran,' which became the rallying cry of the day. Opponents fault Russia for supporting the regime and it is widely believed that Moscow has trained and aided security and intelligence forces involved in the crackdown of the past months. 'I am amazed that those who have suffered for the revolution and are concerned about the honor of this revolution remained silent in the face of such slogans and acts and [...] did not stop these people,' said Majlis Speaker Larijani. 'Such slogans tarnish the honor of Islam,' said Larijani, apparently having forgotten his pocket thesaurus at home and employing the word honor or ezzat for the umpteenth time to convey the force of his ideas. In his speech in Ghom, Larijani indirectly stressed the importance of the Israeli-Palestinian issue as one of the pillars of the Islamic regime. 'In these difficult times, Iran, in its struggle against the United States, must be the defender of the rights of the Palestinian people and other oppressed Muslim people,' said Larijani. He did not mention the Uighurs in China or the Chechens in the Russian Federation. 'The country's political independence [...] depends on defending and following the Supreme Leader of the revolution and the concept of the guardianship of the jurisprudent,' Larijani contended. In Larijani's analysis, this devotion and unity was in short supply on Ghods Day. In addition to the thousands of security forces deployed around Iran's major cities on that day, dozens of mobile sound units on trucks were also sent among the demonstrators. But the voices of official chant-masters standing on the backs of the vehicles were drowned out by the deafening counter-slogans of the protesters. 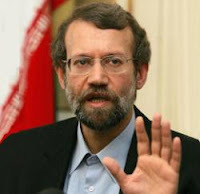 Larijani is not the only official to have been distressed by the alternate chants on Ghods Day. In a letter to former President Mohammad Khatami and Mir Hossein Mousavi, Ahmad Tavakoli, conservative Malis representative from Tehran, demanded that the opposition leaders clearly state their position on such contrary slogans. If you agree with such slogans, 'how will you answer to the Imam,' he asked, alluding to the late founder of the Islamic Republic, Ayatollah Ruhollah Khomeini.